This page has information and articles on Korea and on educational trends in Korea for U.S. schools and educational institutions. 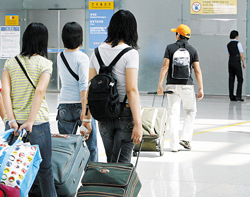 More and more Korean students are choosing China as a destination for educational and employment. Whether they are earning a degree in the country or pursuing language studies, China is widely accepted by students as a pathway to future (if not the immediate present) success. In the last decade in Korea there has been a sharp rise in the number of Chinese language academies or hagwons, and even foreign language high schools have cohorts of students who specialize in Chinese. Clearly, Koreans are keenly aware of the importance of China in Korea’s future, and they are getting ready. Take a look at this article from Bloomberg News for more information. We got word of this article from NAFSA news. Check out this article from the Times Higher Education that reports that Korean companies invest nearly $100,000 per scholar for research–the largest investment per scholar in the world! The investment in education in South Korea starts early and continues well into the university years. We have had recent reports of scams involving calls appearing to come from U.S. Citizenship and Immigration Services (USCIS). Please advise your students against sending money to people they do not know, or to confirm that they are dealing with a legitimate business or group. As South Korea wraps up the Special Olympics in Pyeongchang today, we congratulate the athletes on representing their countries proudly! Opportunities for the disabled and remains an issue in Korea, but one many are hoping to affect positively through exchanges of scholars, ideas, and students. A recent visit by Dr. Judith Heumann, efforts by local schools and institutions and even U.S. universities such as Gallaudet University, show that times may be changing, and EducationUSA is ready to help be a part of that change. We at EducationUSA are always happy to hear about opportunities that might be available for Korean students. Please do not hesitate to contact us at usec@fulbright.or.kr if there is an opportunity you would like to share with us. Enjoy the article! PYEONGCHANG, South Korea (AP) — South Korea began showing off its new snow sports mecca with the opening of the Special Olympics on Tuesday, Jan. 29. Pyeongchang, the once-sleepy hamlet in the mountains east of the capital, will also host the Winter Olympics in five years. But the arrival of 3,000 intellectually disabled athletes from around the world has also spotlighted South Korea’s long-criticized treatment of the disabled, who for decades were kept out of sight and out of the mainstream. About 5 percent, or 2.5 million, of South Korea’s 50 million people are either physically or intellectually disabled. Among them, about 7 percent are intellectually disabled, according to government statistics. South Korea classifies the physically and intellectually disabled on a scale of one to six, based on the severity of their disability. The government says the system guarantees fairness in determining what support each disabled person should receive. Critics, however, call it a human rights violation, arguing the classification grades bodies “like meat” and stigmatizes the disabled in a society already that disdains them. They also say the six-step breakdown of disability is ineffective in meeting the diverse individual needs of the disabled. Many workplaces in South Korea still shun employing the disabled, and South Koreans are largely indifferent to the roadblocks that keep the disabled from entering society. “The classification determines your social status in South Korea if you are disabled,” said Jeong Jong-hwa, a professor of welfare studies at Seoul’s Samyook University. In a 2009 study, the poverty rate for the disabled in South Korea ranked fourth-highest among 27 developed nations, while government spending for the disabled was the second-lowest among 30 developed countries surveyed, according to the Organization of Economic Co-operation and Development. South Korea’s bid to host the Special Olympics was launched after former lawmaker Na Kyung-won — herself the mother of a child with Down Syndrome — attended the Special Olympics in the U.S. state of Idaho in 2009. Na said she was dismayed that South Korea’s Special Olympics team was competing with almost no support from the government. “South Korea boasts a world-class economy, but what I saw in Idaho showed where we stood in our welfare policy for the disabled,” Na said in a written interview. Taking the project on as a personal mission, Na lobbied to improve support for sports for South Korea’s intellectually disabled. She will host the opening ceremony of the eight-day Pyeongchang Special Olympics as the games’ chief organizer. Conservative ruling party candidate Park Geun-hye’s victory in the December presidential election, and her platform of sweeping welfare policies, has given some hope to those who want to abolish the classification system. Park’s policy blueprint on her campaign website says there’s a need to either reform or abolish the system. Park takes office in late February. The games take place as worries persist that the resort hosting both the Special Olympics and the 2018 Winter Games may go bankrupt this year if the government refuses to extend the expiration of bonds worth hundreds of millions of dollars spent building the venue. Na said she also extended an invitation to North Korea. Associated Press writer Sam Kim reported from Seoul, South Korea.